Holy moly. I think I almost had a bookish heart-attack reading this book. 'Fo realz yo' I actually had to turn it off a few times and start listening to something completely different so I could ACTUALLY sleep (y'know, because some people actually have to go to work!). I'm not sure whether The Shining just had a pulse and expressed my own deep rooted and illogical fears, or whether it was the coming together of the movie with the book that was freaking me out. Either way, I really was biting my nails for a week. It took me so long to listen to this, and the real reason, the honest reason was some nights I was just feeling a little too vulnerable (haha, I sound like a lunatic) and needed something light hearted. So the book goes like this. The Torrance family, on the verge of being down and out, take up temporary residence in the Overlook Hotel. Jack, the patriarch, is the Overlook's newest caretaker. He is in charge of looking after the building and its grounds during the winter months when snow pretty much cuts it off from the world. 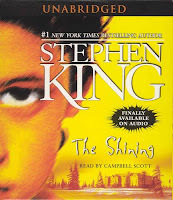 Danny Torrance, a child with psychic abilities is not feeling too thrilled, and in fact is being haunted by terrifying dreams about the Overlook, and what may be waiting for them. Jack loves the Overlook, desperately, but the Overlook is a personality in itself, and it is greedy and wants Danny, and it will do anything to get him. Campbell Scott is the narrator for this book, and what a narrator he is! In fact, as a narrator I'd easily give him 5*, he is EERIE, fantastic, believable and I kid you not sometimes he was able give me goosebumps. In fact, it was weird, there were even times when I would swear he sounded a little like Jack Nicholson's Jack Torrance. The presentation is excellent. I downloaded it from Audible and of course, as usual it was delivered promptly to my phone and I enjoyed it. The story unfolds at a leisurely pace. King does not rush his narrative at all and gives the reader plenty of time to be slowly terrified. I think the best part of the novel is that growing sensation of dread, the same way that Danny is teased by his dreams we, the readers, are constantly teased by King. When you think something awful is going to happen, sometimes you're right and want to cry a little, sometimes you're wrong and you curse King for freaking you out. What I found interesting about the novel, in comparison to the movie is Wendy. Wendy, played by the wonderful Shelley Duvall is a semi-weak, floundering and unassuming character, whilst King's Wendy has a lot more oomph to her, and speaks her mind... a lot! Although I also greatly enjoyed Duvall's (Kubrick's) version of Wendy, I was surprised by King's version... and much preferred her. There are also lots of different themes and scenes that are added and taken away by Kubrick in the movie, and I know die-hard King fans spit on the movie but y'know what? I think it's an awesome re-imagining of the book. The movie and the book itself are so embedded in our culture now that we should all pay homage to its epicness. Forgive me Stephen King for only just getting around to reading it. People kind of roll their eyes when you talk about Stephen King - it's as if you consider Mills & Boon novels to be high-literature. I think what is forgotten about Stephen King is that he is an artist, just a study of his language alone would blow your mind. If we forget the excellence of King's command of our humble language, then he can easily become a joke, and I think that's so sad, he's completely taken for granted because the majority of people (I've met anyway) barely consider the language when they read and focus on the story alone (which of course is important! But language is too!!). Rant over. So my point is, is that give Stephen King a chance and just look at the language and I promise you, I double promise and Brownie promise that you'll see King in a different light! I want to read that book! Actually I want to read Stephen King's work but every time I am lost and I don't know what to pick. I believe The Shining mya be a good start! 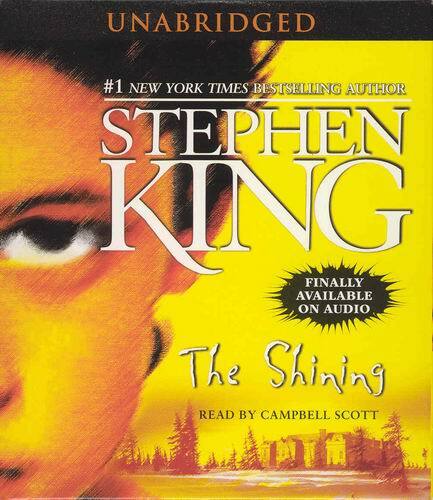 Yes, The Shining is awesome and is a good place to start. I also recommend Salem's Lot if you enjoy vampire novels... by vampires I do not mean sparkling ones but real, cold blooded, scary vampires! It'll (hopefully) rock your world. Will you be reading Dr Sleep?! I read this several weeks ago for my book-club and it took aaageess because I had to have a break at every terrifying scene which was almost every other page. Five stars! Hahaha, so you're a scaredy-cat like me then Ghadeer? Haha! Have you read any other Stephen King books?